Greece, a country with a history that is ours. A country where the traveler is welcomed as an old friend who has returned. His flag represents the deep blue and transparent waters. Greece and its islands, each a world of their landscapes and personality that make us feel like the gods of Olympus. Greece, means a haven for the traveler who wants to experience the essence of Western civilization. Greece is culture, art, customs, sea, coasts that are mixed with an unforgettable landscape of endless blue waters and enduring in the memory of who comes to meet her. 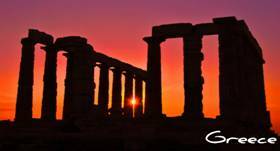 Greece, with its distinctive architecture, mythology and friendly hospitality. Each island a dream, or rather a wish come true. State of southern Europe belonging to the European Economic Community, south of the Balkan peninsula. In addition to a mainland, including the Ionian islands of Crete and almost all the Aegean Sea. Bordered on the north by Yugoslavia and Bulgaria, to the East European Turkey and the Aegean Sea on the south by the Mediterranean on the west by the Ionian Sea, and NOT with Albania. The coast of Greece has many incoming outgoing, so that being the smallest of the southern peninsulas of Europe, which has higher development costs. One of its many gulfs, that of Lepanto or Corinth, Peloponnese rest of the country, leaving the region connected to the mainland only by the isthmus of Corinth, now traversed by a canal. Pindo or saw the Hellenic (from Hellas and Hellas, Greece's national name), which crosses it from north to south, leave many ramifications that are massifs of Othrys and Olympus, and continue south into long and narrow as the Attica and the Argolis, which in turn are extended by strings of islands of Euboea, the Cyclades, Sporades, etc.. The main rivers are the Aspropótamo, the Struma, Vardar and Maritza. The climate, warm and dry is generally healthy. Mild, mild, wet winters, hot summers to dry. Greece enjoys a Mediterranean climate. In summer the days are long and high temperatures, often at the end of the day can be a refreshing breeze, especially in coastal areas and in the north. In Athens summer days can reach 42 º C. Winters are mild in the south and colder in the north. The rainy season is from November to March. Clothing: Light clothes and cotton clothes during summer months if you are visiting the coast should take some light warm clothing for evenings. By the fall must wear a raincoat or windbreaker. In the north the winters are cold so you should bring many warm clothes. Total area: 131.940 km ², land area: 130.800 km ², Annual crops: 23% permanent crops: 8% meadows and pastures: 40% forest and woodland: 20% Other: 9%. Greece has a total of 13.676 km. Continental shelf: 200 m depth or the depth of exploitation. Territorial sea: 6 nm. Greece has a mixed capitalist economy. The private economic base underwent great changes with the Socialists 1981-89, which increased the public sector 55% of GDP in 1981 to 70% in 1989. Tourism is the main foreign exchange earner and has a self-sufficient agriculture, except dairy, meat and animal feed. Despite a modest recovery in manufacturing productivity last year, the economy is still weak, with real GDP growth of 1.7% and between the huge public sector expenditure and diversion of the budget has reached a debt public 120% of GDP. The strong drachma policy and spending cuts in the public sector, reduced inflation, which reached its lowest level in the last 20 years. The economic growth in 1996 is based on investments, but depends greatly Athens the help of the European Union, representing 4% of GDP. The reputation of the new Prime Minister Simitis, as the architect of the austerity program of the mid-80, suggests that policy measures continue to apply prudent to take Greece to qualify for participation in EMU, but tripped over opposition to further privatization and greater austerity. The Greek economy was largely agricultural country before entry into the European Union. Have since been developed and textile industries: steel, cement, mining and metallurgy, chemical, food processing, garment and footwear. However 20% of the population still works in agriculture, which represents a high percentage in relation to other EU countries. Tourism in Greece is the main country's service industry, which received a great development during the 80 and 90. Greece receives more than 10 million tourists a year. Shipbuilding is also an important sector that generates lots of revenue, Greece has one of the largest merchant fleets in the world. Greek companies have great difficulty in penetrating the European market because of its size (very small enterprises) and high transport costs. However, the country exports wheat, barley, corn, fruit snuff and the rest of the EU. The economy has benefited from subsidies and grants from the EU, especially in reducing the deficit. The economy has grown considerably over the past 20 years and living standards approaching the European average. During the 90's, the governments of both left and right have tried to implement a program of privatization of state enterprises especially oil and telecommunications. The public deficit prevented Greece was part of the Euro zone when the project design of the single currency, but finally reached this goal in January 2002 and is one of the countries adopting the euro. Trade with the European Union constitutes 65% of total trade. Other trading partners of Greece are: Saudi Arabia (oil) Japan and the United States. Money: Currency: The euro = 100 cents. There are 500, 200, 100, 50, 20, 10 and 5 euros. The coins are 1 and 2 Euros and 50, 20, 10, 5, 2 and 1 cents. Currency Exchange: You can change money at banks, savings banks and bureaux de change. Credit cards: Most sites accept most credit and debit cards in Europe, as well as MasterCard, American Express, Diners Club, Visa and Electron. Are advised to check with your card issuer, the possibility of merchant, and the facilities to which you can access in Greece. Travelers Checks: Checks issued to international currencies are accepted at almost all sites and can be easily changed at banks. Banks usually charge a minimum fee of 0.15 euros and 13.21 euros maximum. Exchange rates: Below are the exchange rates of the euro against the U.S. dollar as the exchange rate on November 1, 2005: 1 euro = $ 1.37. Restrictions: No restrictions on the import or export of currency, but must state the amounts that are greater than € 10,000. The euro and foreign currency export is permitted, although quantities exceeding 2,000 euros require Import Declaration Form Currency is issued on arrival to the country. Amounts in excess of $ 10,000 require the same form or a Certificate of Authorization to Import. Banking hours: From 08.00 to 14.00 to 16.00 Monday to Thursday and from 08.00 to 13.30 on Fridays. Banks usually open some islands in the afternoon, and during the peak tourist season extend their hours to offer currency exchange. Greece is one hour ahead in relation to mainland Spain. So if in peninsular Spain 11:00 in Greece will be 12:00. Changes in summer / winter occur at the same time in both countries. In restaurants the food is prepared in a simple and attractive, and is made from raw materials of excellent quality, the main ingredient is olive oil. The grilled meats are also very popular. The most popular dishes such as dolmades (vine leaves stuffed with), moussaka (eggplant with lamb, cinnamon, red wine and olive oil) and avgolemono kebabs (chicken with rice, eggs and lemon juice) are in everywhere. The taramasalata (a sauce made basa fish eggs, bread, olive oil, onions and lemon juice) and a variety of dishes based on seafood, especially squid (kalamari) or octopus, are exquisite. The typical Greek menus include a selection of meze (inputs) and keftedes (spicy meatballs) or tzatziki (a dip made from yogurt, olive oil, garlic, cucumber and dill). The salads are excellent and generally lead feta that is a sheep milk cheese, cucumbers, olives and tomatoes. Another specialty is the kolokithakia (small zucchini with olive oil and garlic). Greek olives are excellent. The desserts are baklavas (a paste made from puff pastry with honey, vanilla and almonds) or loukoumades (puff pastries made with honey). All restaurants have menus which include the price of each dish. There are many international restaurants. In general, restaurants are open from 12.00 to 15.00 for lunch and from 20.00 to 24.00 for dinner. The most common is that they have waiter service. Drink: One of the most popular drinks in Greece is retsina made of the pinion pine. The most popular local liquor is ouzo, an aniseed-flavored drink that is a clouding that adding a little water (very similar to Spanish anise). Coffee Greek, Turkish influence is served strong and sweet. The pilsner type beer. The times of the bars vary by region and local regulations. Santorini, in our opinion, the jewel of the Cyclades. It is absolutely different from all the Cyclades islands or any island in the Aegean. Its geological setting gives you that unique wild beauty. The island takes its present form by sinking the huge caldera volcano. 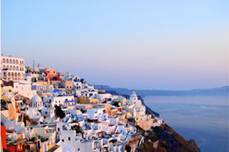 Its capital is the town of Thira and its main port on the Acinios. Its soil is mostly volcanic. Crescent shaped and the inside, where once the great volcano, there are a number of smaller islands, but very beautiful. To the west is steep and rocky, highlighting the great cliff above the sea, while to the south is slowly descending to the sea where the dark sand beaches fall in love the feelings of the traveler. We advised to stay to the west, ie close to the boiler that has no beach but has the magic of the landscape and the best atmosphere of the island. Staying at Santorini has an added incentive for some is that many hotels have small, Mediterranean, with its charming terrace overlooking the famous Caldera named. "To our knowledge, the jewel of the Cyclades. Santorini is absolutely different from all the Cyclades islands or any island in the Aegean. Its geological setting gives you that unique wild beauty." Thira, the capital, is perhaps the most beautiful and unique town of the Aegean. It is built and leaning over the edge of a cliff looking over the gap left by the volcano. This gap is known as Caldera, now occupied by the sea. It has a small port below Thira this statement with a funicular or hundreds of steps, if you want to get on foot or riding donkeys numerous costly to perform this daily task. Also, from this port leave the boats that perform very desirable excursions to the islands of Nea Cameni interior, with its warm waters, Palea Kameni and beautiful neighbor Thirassia, which arises as a copy of Santorini but even more authentic by the small but amazing island of Aspro. Probably the most famous Greek island. With a typically Cycladic islands, arid and surrounded by magnificent beaches. It owes its fame to the beauty of its capital, its white houses and narrow passages endearing, and their numerous high quality beaches. It owes its fame to the beauty of its capital, its white houses and narrow passages endearing, and their numerous high quality beaches. This is a much visited island, with a marked nightlife and crazy. Here we make an important point, namely that there is a gay, but as much as anywhere else, and how this environment there are many more, as many as can be on the island of Ibiza or Tenerife. The tourist has to bear in mind that this is a small island and therefore the distances are short. The island of Mykonos increasingly, is elected on a trip to Greece as a single destination, and also increasingly customers are repeaters on this island and they say that is the best island to human relationships, since their size is small everyone is close to others. You can arrive by plane from Athens, with frequent flights from Rhodes, Santorini, Crete and Thessaloniki. For regular daily ferry from Piraeus with a duration of approximately seven hours, quite uncomfortable, but very economical. Another intermediate system is the jet. It takes about four hours, costs half the plane, but leaves the Piraeus, but from Rafina, 45 kilometers from Athens, you have to have the cost of that shipment. For ferry also connects to other major islands and next. Its capital, Mykonos town, noted for the beauty and magic of its narrow, winding streets, picturesque houses whitewashed, the flowers that adorn their balconies, arches and multicolored flowers. Visit the Church of the Blessed Virgin Paraportiani that, according to tradition, is the most important of the 400 churches and chapels scattered throughout the small island. The Castro district is located in the upper zone, where the Venetians built a castle of which only remains. At the bottom find the so-called Little Venice of Mykonos. It is the most picturesque village with its houses built leaning out over the sea, with beautiful wooden balconies. These houses have become the most curious bars of the island. In a square near the cathedral is an ancient Catholic Church. Very close to these, on a large square gazebo, are the famous windmills, which together with the Pelican Petros are the symbols of the island. At Pelican will find with certainty during his walks, and flowing freely through the village as Petros home. From its picturesque harbor traditional small boats depart continually leading to all parts of the coast of the island, as well as day trips to neighboring islands and Delos. The village has a small archaeological museum, folklore and other naval museum. South of the island, Lino, are preserved the ruins of Transportation. In Platis Yalos, a small town a few kms. of the capital, find a small harbor from which extend many small boats to all the beaches, the famous and less. In the area of ​​Ano Mera is the monastery of Panagia Turliani. In Palaikastro remains of an ancient fortification.